A conservatory full of exotic blooms: An extension of your garden. If you think of your conservatory as part of your garden, not an extension of your house, you may be less tempted to fill it with house plants and instead attempt to grow some more unusual plants in its enclosed and protected environment. The siting of a conservatory: Unlike a greenhouse, which you can site in the best possible place, a conservatory is usually positioned on whichever side of the house it looks the best. Your conservatory will have higher temperatures than a greenhouse as it is sheltered by your house, and if it is connected to your domestic central heating system, you should be able to grow a good range of plants. Your problem may be keeping it cool, not heating it. Light levels are generally lower than in a greenhouse, though you will need to think carefully about ventilation and shading if your conservatory is in full sun. Building materials: PVCu is the most popular material today, but although it is inexpensive and almost maintenance-free, it lacks the traditional feel of wood. A wooden framework is decorative and helps to give a more natural look but requires regular maintenance, which the less-appealing and slightly cooler aluminium models do not. 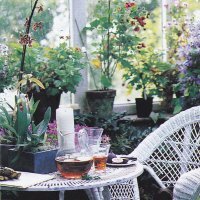 Keeping the heating costs low: To minimise the cost of heating, grow plants from a temperate climate such as bottlebrush, citrus and pelargoniums. These can be taken outside in the summer and brought back inside before the first frosts. Central heating and air conditioning dry the air and can encourage pests and diseases. Because a conservatory probably doubles as a living area, it is even more important to use organic and biological control methods rather than chemical ones than it is in a greenhouse. If you do have to spray take the infected plants and spray them outside. Make sure they are dry before you bring them back in. Use all of the vertical space: Paint the walls of your conservatory a light colour as this helps to reflect the light and will set off your plants well. 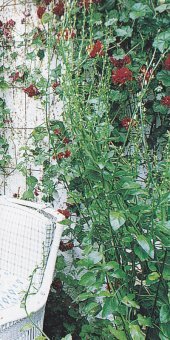 Train climbers such as plumbago and bougainvillea up wires attached to the wall to provide an attractive backdrop. Place moisture-loving plants on the floor and add some staging so plants that prefer drier air can be kept higher. If you include soil beds in your conservatory, you can grow really tall specimen plants with their roots in the ground, rather than being restricted to pots and other containers. Creating the ambience: Choose hard-wearing furniture with a tropical feel and make sure that the materials used will not be damaged by strong sunlight or a moist atmosphere. Wicker and cane are popular but they may not be as resilient to water or compost spills as wrought iron or wood. Outdoor garden furniture is ideal as it has been built to withstand the elements. 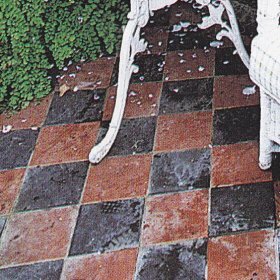 Use tiles, stone or treated hardwoods on the floor: These will be easy to clean and will cope well with damp conditions. A cold frame is an important piece of equipment, especially if you use the greenhouse to raise seedlings for planting outside. If plants that have been raised in the warm, humid conditions of the greenhouse are put straight out in the open ground, their rate of growth will be considerably reduced. This is especially so in colder climates in the early spring. The plants need to be acclimatized gradually to lower temperatures and increased exposure, a process called hardening off. The best way to do this is with a cold frame. 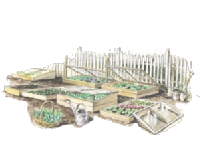 Frames can also be used during the spring in colder climates to grow early vegetables of all kinds and such crops as melons. "They also come in useful in the winter for growing vegetables that mature in spring, like lettuces." The frame you choose must be deep enough to accommodate the range of plants you wish to grow and let in plenty of light.